There’s no doubt that this month's biggest cruise story was the majority acquisition of Silversea by Royal Caribbean, which captured widespread attention throughout the travel world. It's Royal's first major brand expansion involving a European-owned but North-American-oriented brand in 20+ years. Cruise Week Correspondent Art Sbarsky, who was personally involved in RCL's acquisition of Celebrity Cruises back in 1997 when he was an SVP for Celebrity, describes what Royal is getting for its newest investment and why he suspects the Royal/Silversea partnership will be a winning move for both companies. In June 2008, Silversea entered the expedition cruise market, debuting the extensively redone Prince Albert II as its first ship in that part of the fleet. Subsequently it was renamed the Silver Explorer. The most recent addition is Silver Cloud, where the 10-year anniversary of Silversea's venture into expedition cruising was recently celebrated. The 298-passenger Silver Cloud began its travels in 1994 as the first luxury ship custom-built for Silversea. It left that part of the company in 2017, underwent $40 million worth of changes and renovations, and came back as a 254-guest ice-class expedition ship last November. Silver Cloud's addition brought Silversea's expedition fleet to four ships, and the line has hinted at further expansion to come. At the 10-year celebration press conference, Silversea Chairman Manfredi Lefebvre d'Ovidio said he hopes the total fleet will grow to at least twelve ships. 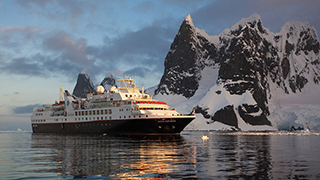 Most likely to join the expedition class, although nothing has been said officially, will be Silver Wind, the other small ship in Silversea's classic fleet. Silver Cloud's conversion marked the first time that Silversea had taken an existing classic ship and turned it into an expedition vessel. During the 10-year celebration, Silversea’s Mark Conroy, managing director, Americas, used the word hybrid a lot when defining the nature of the luxury expedition experience aboard Silver Cloud. He is correct. Not only is the new interior decor gorgeous, but the guest-to-crew ratio is essentially 1 to 1, with a space ratio of 66. The guest-to-crew figure is similar on Silver Explorer andSilver Discoverer, but the space ratios for those ships are 42 and 45, respectively. I don't recall it feeling tight or even less spacious on the older ships, but without a doubt Silver Cloud has a very spacious feeling to it. During the recent press event from London to Dublin, there was really nothing on board that advertised it as an expedition ship, other than the 16 zodiacs and the special life vests in the suites. But having been on both Silver Explorer and Silver Discoverer in the past, I really appreciate the combination of an upper-luxury cruise experience while exploring harder-to-get-to locations. For instance, at the press event, we were able to dock right on the Thames near the Tower Bridge of London. When we took off, the bridge opened up to let us through, and it was an outstanding visual for those of us on board. The expedition part of Silversea has already made nearly 12,000 port calls, reaching 129 countries, and Royal can gain some valuable insight from Silversea's experience. Expeditions are a complicated business, with planning time for the more far-flung itineraries (think Bangladesh, Ghana, Togo, and the Northwest Passage) taking over two years. Logistically, provisioning and staffing are complicated, and figuring out demand for out-of-the-way locales and sailing times is an art. But all that effort sets Silversea apart from the run-of-the-mill lines sailing the same old paths, making Silversea far more attractive as a takeover target than it was a decade ago.